An event is not an event without a hashtag. If you plan on engaging with event attendees online before, during, and after your event, you must create a hashtag for your event. Hashtags are words or phrases used to filter or categorize content around a particular topic (in this case, your event). By clicking on a hashtag, users and businesses can quickly see all of the posts associated with the hashtag. As a result, hashtags are an effective marketing tool. Twitter user Chris Messina (@chrismessina) first Tweeted with a hashtag symbol # in August 2007, as a way to define groups on the social media site. The use of the pound symbol to categorize messages and define conversations spread quickly throughout the Twitter community, and is now an integral part of this fast-paced live information network. Hashtags are not only used to generate conversations around your event, but they are also used to help market your event as well. As a potential event attendee, you can get started experiencing the buzz created around the event by consuming event content before you step foot on location. You can view the other attendees and get a glimpse of what they have to offer. You can also check out past photos and even review opinions about the event. All of these engagements will bode well for both the event organizer and attendee. The former will get increased consumer engagement and the latter will provide information that influences purchase decisions. This takes place all before your event begins! Bottom line, if you want to enhance your digital branding and have your event stand out from the competition, create a hashtag for your event. So how do you get started creating a hashtag for an event? This post will go through the steps to help get you started today. Creating a hashtag for your event is easy. You want to develop one that is unique and appropriate for your event. Does your audience even know what a hashtag is? That’s a critical question to ask before you create a hashtag for your event. Understanding your audience and how they utilize social media will help you determine if you need a hashtag. Are your attendees in a demographic that uses social media sites like Facebook, Instagram, and Twitter? If your event attendee demographic uses social media regularly, a hashtag will be a great addition to your event. As you begin to brainstorm hashtag ideas, be sure to include other’s ideas in this process. Come up with many ideas and variations of the hashtag, so you have several options from which you may choose. Your hashtag should be recognizable and easily associated with your event. DBI TIP: only include hashtags in your posts where your hashtag makes sense. There are many hashtag generators you can use to get ideas for your next event hashtag. Here is a couple. Hashtagify.me – allows you conduct searches and find the best hashtags to reach your audience. Trendsmap – Generates hashtag ideas for you to use based on your business, location, and event. It’s important to have a hashtag that’s unique or else your event can be easily lost in the shuffle or mistaken for another event. Once you’ve decided on a hashtag, the next step of creating a hashtag for your event is to search for it. Search for hashtags on social media platforms by going to the search bar on Facebook, Twitter, and Instagram, and typing in the hashtag you’re thinking of using. If you search for your hashtag and another business has already used it, it’s in your best interest to start over and think of a new hashtag to use. Be sure to include your hashtag on your event’s promotional materials–both online and offline. By doing so, you can increase the hashtag usage and get potential event attendees excited about your event. Continue to use your hashtag throughout your event so attendees can follow along to see what they have missed. This should not be limited to only select messages. You should include your hashtag on everything you post about your event. DIB TIP: Post hashtag signs with your social handles everywhere. 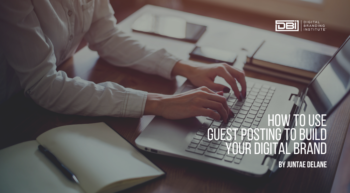 To increase engagement, post in areas where attendees will most likely use their mobile devices such as near registration tables and networking tables. Comment on and like posts by attendees using your hashtag. Also, tag people on Facebook, Twitter, and Instagram who are using your hashtag. On Twitter, you can follow the hashtag and retweet and respond to tweets in real time. Repost photos on Instagram using the Repost app. User generated content enhances your digital branding efforts by providing consumers with an authentic recap of your event from past attendees. Try searching social media for content to post on your accounts. If your customers or event attendees have been using the hashtag, you’ll have plenty of content to repurpose after the event. You should create an event hashtag if you want to increase attendee engagement before, during, and after your event. Potential event attendees can experience your event before attending by getting a glimpse of what the event has to offer. They can check out past photos and review opinions about the event from past attendees. Overall, creating a hashtag for your event benefits the attendee and event organizer which is a win-win.